The climbing plant Ficus Pumila Minima provides an excellent cover for fences, wall and other surfaces. It is easy care and requires minimal attention once established. If you are looking for a small leafed climbing plant then Ficus pumila Minima is worth consideration. This is the small leafed version of the species an the leaves are around 1/3 the size. 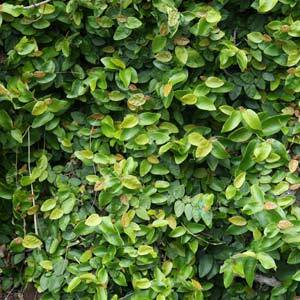 An evergreen climbing or creeping plant F. pumila minima is often referred to as the ‘Creeping Fig. With small oval shaped foliage. This is a fast growing climber that will cling to masonry walls, prefers semi shade and is excellent for covering up large areas with a screen of evergreen leaves. All details are the same for the species F. pumila, except for the foliage size. Climbing easily to a height of 5m and capable of reaching twice this. Ficus pumila will fruit once mature, however the small fruits are inedible. New foliage is a medium green, as the foliage ages it becomes darker and takes on a leathery, tougher texture. This is a self clinging climber. It attaches itself to ant surface where the roots can take hold, all it needs is a little texture. The stems are held tightly against the surface of the support, in good conditions the foliage completely covers the stems over time. Ficus pumila will flower, although they are insignificant, sometimes it will fruit. Ficus pumila is drought tolerant, frost tolerant and even copes with coastal conditions. Grown as a ‘covering plant’ it will cope with a range of soil types, however is more vigorous in a humus rich well drained soil with some moisture. Prune regularly to control growth and promote new foliage which is more attractive than the older foliage. Ficus pumila Minima – A small leafed variety with foliage to 1/3rd the size of the species. Ficus pumila- The species with larger foliage. In some areas of Australia Ficus pumila is declared a weed. In an urban environment in a confined area this is a very useful plant, and can actually be used safely. In areas where it can escape, it can become a vigorous environmental weed. It is important to consider the structure that you grow these plants on as the self clinging roots can damage walls over time. It should never be allowed to grow on buildings where if can not be controlled. Careful use where it has any possibility of entering a roof space. Best used on fences in a confined situation where it can be a very attractive cover in otherwise difficult situations. A number of gardeners who have planted Ficus pumila in the wrong spot have asked about removal. The root system is vigorous so this males digging difficult. Try this method. Cut back and remove upper foliage down to about 1m. Choose a warm day with no rain forecast. Spray the remaining foliage with a herbicide such as Zero or Roundup. We like to mix in some kitchen dishwashing liquid. One week later cut the stems close to the ground and paint the wounds with the same herbicide using a stronger application. The cut area needs to painted with the herbicide immediately after it has been cut for maximum effect. Generally available for sale at most large garden centres.